I’m a huge Arrested Development fan. I’d been looking forward to the show’s return since the day it was canceled and went off the air, hoping against hope that one day it might rise in glory again. So when Netflix brought it back from the dead, I was overjoyed. I’ve been looking forward to new episodes since it was announced. As most of you know, those episodes came online Sunday. There are 15 of them. I’ve now watched 12. Warning: some serious nerding out ahead. If you’re not an AD fan, then this probably isn’t the blog post for you. If you are an AD fan, then I’ll do my best not to spoil anything for you. Ready? Honestly, at first I was kind of disappointed with the season. The first episode was okay, but everyone was different. Lindsay looked very different. (Nose job? Botox?) George Michael was older. Tobias was fatter. Maeby was older, too. Somehow in my head, I’d envisioned a return to the exact same show I’ve loved so much over the years. And of course that’s not possible. But it wasn’t just the characters looking different. The show itself seemed changed. One of the strengths of the original series was how the shows were done individually. Things that weren’t funny at first set up things that were hilarious later on, as the show began to flesh out each storyline, adding layer and layer of references to plot elements, pop culture tidbits, character development–it all just builds until by the end, everything explodes in a fountain of awesome. This season wasn’t like that. The next few episodes just didn’t seem to be coming together. Had I been wrong? Had I built my hopes up too high? Another thing I noticed–the original was 100% an ensemble show. You need to have all the characters together to have the real funny happen. Gob by himself or George Michael alone, or George, Sr–they needed each other to act as foils. With this new season’s focus on an individual character each episode, a lot of that ensemble feel seemed to be missing. I was beginning to lose faith. To doubt. But then episode 5 (a Tobias episode) hit, and it was hilarious. And I kept watching. And bit by bit, it dawned on me. Season 4 isn’t a season at all. It’s one extremely long episode. 7 hours or so. And just like with the original, the funny afterburners don’t kick in right away. It takes time to lay the foundation. So the first few episodes are all about setting up the rest of the show. You literally have a punch line given in the first episode that isn’t even remotely funny until the 12th–6 hours or so later. 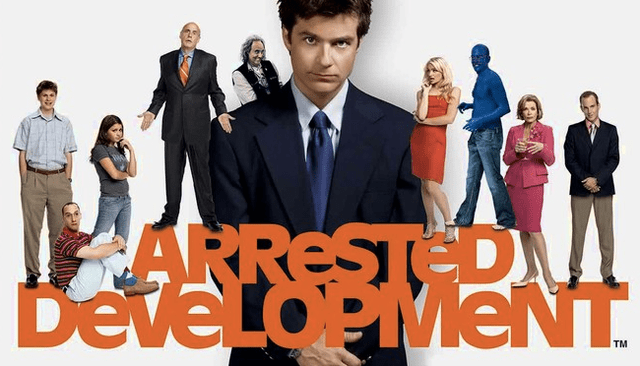 Arrested Development took the formula of the original show, and they changed it. Exploded it for a new platform. Binge watching. People can and do watch hours of a show each night, not just a half hour or an hour here or there, once a week. The show could afford to work on a much more macro scale than it was before. And it needed to in order to succeed. The show’s stars are too big these days. Scheduling must have been a nightmare. They couldn’t do it like they used to, so they found a new way to get it done. My faith in the show is restored. I’ve been loving the episodes, and I look forward to rewatching them and getting even more of the funny out of them. I’m also very curious to see where this type of show takes the future of serial programming. I really do think it’s a fundamentally different approach, much more of a hybrid between a movie and a TV show. True, shows like Lost and 24 have already been doing that sort of thing, but it’s just getting more and more complex. AD is certainly the first comedy I can recall that’s attempted it. Anyway–there are my thoughts. I’d love to hear what other AD fans are thinking of the show. Please share! Watched Ep. 10 last night. I agree with your assessment on the one long episode. What I noticed is that some characters are great on their own, and some have to be almost side characters. To me, Lindsey & George Sr. are those characters that need a strong supporting cast to be fun to watch. Their episodes thusfar, even when more of the jokes are coming out, just aren’t as good as the other ones. I also have noticed that it has taken a bit for them to get used to their characters again (except Gob…cause he always plays the same character). But yeah, after Episode 5 I felt like momentum was driving the show back into the good. The Lucille episode was pretty great for me, and the Tobias one as well. Lastly, so far the jokes are too long. 5 minutes can easily be cut from each episode, and it would have made many of the jokes punchier. They go from awkward and funny to overplayed pretty quickly. This happens less often now, but those first few episodes were brutal with a lack of editing. And Seth Rogen isn’t funny. At all. I totally agree on the editing. AD used to be all about the snappy pacing. It wasn’t that way in season 4, and it’s a shame. 33 minutes for an episode? Way too long.